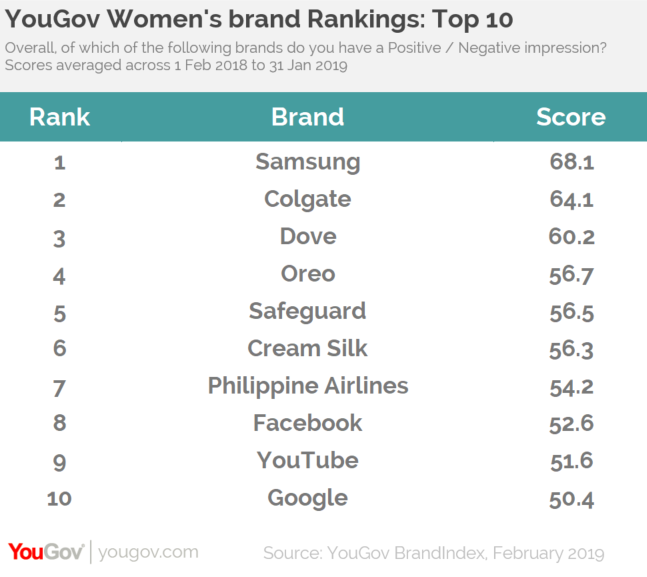 on March 5, 2019, 3:45 p.m.
Samsung tops YouGov’s annual list of the best rated brands among women. In a list otherwise notable for the number of personal care brands, YouGov Plan & Track’s analysis shows that the South Korean electronics giant remains the top contender in this year’s top ten, with the best Impression score of 68.1. YouGov’s women’s rankings looks at the brands that have left the most positive impression on women. The rest of the top ten mostly comprises of personal care brands, with Colgate in second (64.1), followed by Dove in third (60.2), Safeguard in fifth (56.5) and Cream Silk in sixth (56.3). Digital brands also appear to have made a positive impression on Filipino women. Facebook comes in eighth (52.6), followed by video-sharing platform YouTube in ninth (51.6). Technological giant Google comes in tenth (50.4). The list is completed by cookie brand Oreo in fourth (56.7) and national carrier Philippine Airlines in seventh (54.2). The rankings also reveal which brands have seen the biggest increase in Impression among women over the past year. 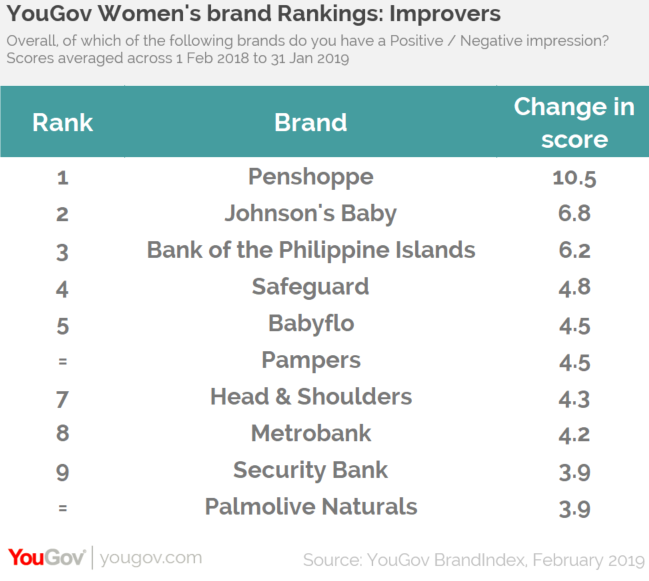 Fashion retailer Penshoppe has the most improved spot, with a score increase of +10.5 points, followed by personal care brand Johnson’s Baby (up +6.8 points) and Bank of the Philippine Islands (up +6.2 points).